Just as the name Robson Lowe is associated with the promotion of postal history – the emphasis on rates, routes, origins and markings of postal covers – so the development of the analogous field of fiscal history – the focus on types, tax rates, origins, and historical and social aspects of revenue-stamped documents – has been the philatelic life’s work of Michael Mahler, whose panoramic exhibit of United States Civil War era fiscal history is presented herein. Besides this signature exhibit, Dr. Mahler has garnered gold medals for a dozen different fiscal history displays, notably on California’s “Gold Rush” revenues; Civil War era use of Federal and State revenue stamps in Nevada; Oregon Insurance stamps; bonds of the Gilded Age showing New York’s Bond Taxes of 1911–20; legal and illegal usages of Proprietary, Playing Cards, and Private-Die stamps of the Civil War era; U.S. First Issue ultramarines; Florida in the Civil War era; whaling during the Civil War era; and the cotton industry during Reconstruction. Key items from all but the last of these are included herein. He has been equally prolific as a researcher and writer. 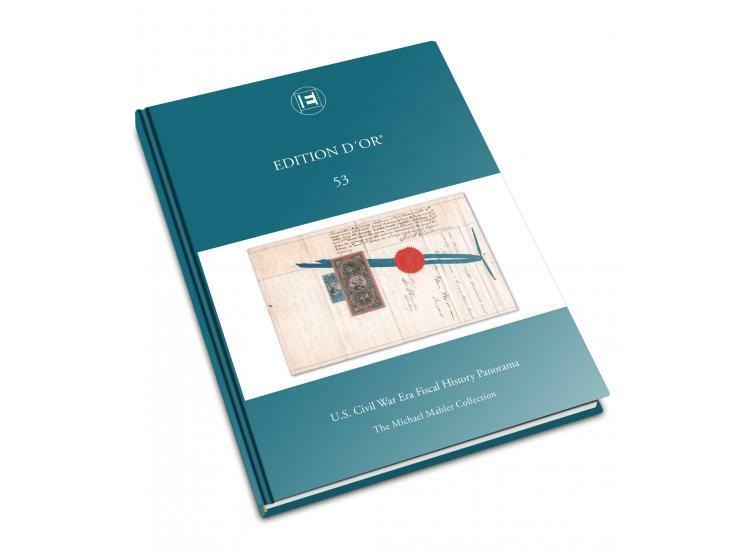 A Catalog of United States Revenue-Stamped Documents of the Civil War Era by Type and Tax Rate (American Revenue Association, 1999), awarded the 2000 U.S. Philatelic Classics Society Elliott Perry Cup, is arguably the most influential work on fiscal history published to date. The monograph How Were U.S. Civil War Documentary and Proprietary Revenues Made Available to the Public? (American Revenue Association, 1993) won the 1993 USPCS Carroll Chase Cup and 1994 American Philatelic Congress Colby award. He is the author of more than fifty articles on fiscal history, most often in The American Revenuer, also State Revenue News, Scripophily, Western Express, The American Philatelist and The Chronicle of the USPCS. Extensive online monographs on Nevada Territory stock certificates; Rebel Documents, Yankee Stamps (on federal stamp taxes in the states of the Confederacy); and California and Nevada State revenues all await publication in book form. 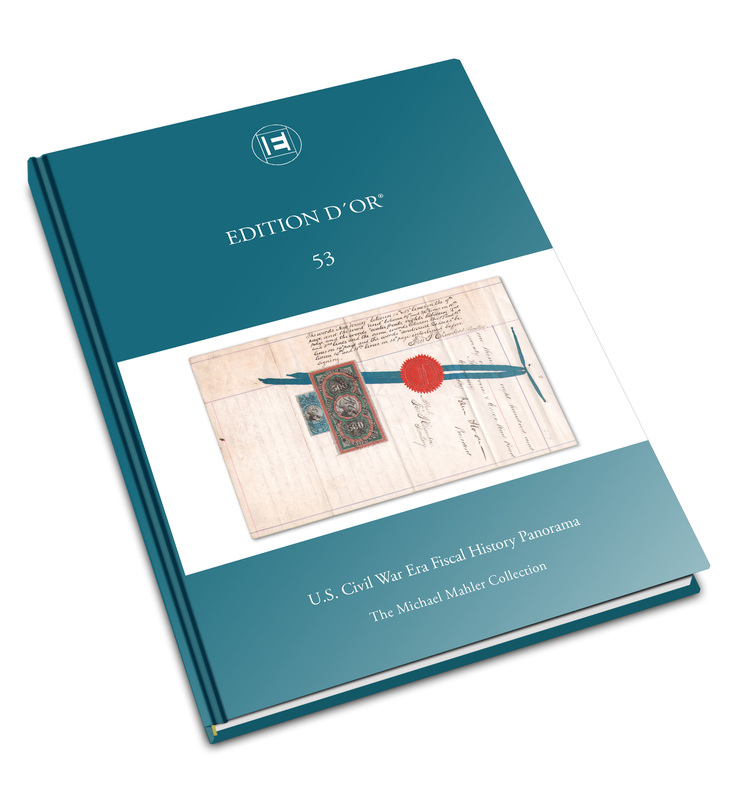 Readers will see herein not only examples of all document types taxed by the U.S. during the Civil War era, and virtually all rates, but in many cases the choicest – and in a few cases the only – examples extant. In the process, as expressed in the author’s overview, “These threads weave a tapestry that encompasses more than stamps, more than tax tables and rates; it transcends the normal bounds of fiscal history and reflects virtually all of life as it was during this tumultuous decade.” We take pride in making this the first U.S. exhibit to be enshrined in an EDITION D´OR, and look forward to fruitful collaboration with other U.S. exhibitors.